Your purring pal sure makes sleep look easy. She passes out on the back of the sofa, while sprawled out in the middle of the living room floor and even on top of that fresh basket of clean laundry. But one thing always makes you raise an eyebrow: She tends to cover her face while snoozing. This is just one of those little behaviors that virtually all cats do. Think of all the positions you sleep in. You may start out on your back with your arms by your side, but by the time morning rolls around, you're lying diagonal with one arm across your chest and the other one flung up over your head. It's comfortable for you -- plain and simple. Same thing applies in the feline world. Princess Sofia gently covers her face just because that happens to be the most comfortable position for her. It might not look comfy, but she's as cozy as can be. If you haven't already noticed, your fur ball will catch some z's anyplace it's warm. 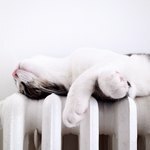 Kitties prefer sleeping where it's toasty and cozy. The downfall of zoning out on the rug and catching that one single beam of sun is that it goes right into her sensitive little eyes. Fortunately, her two front paws act like sunglasses when she covers her face, shielding her eyes from the sun's painfully bright rays. Cats need to feel secure at all times. That's not an easy task during a snooze session. This is why you may have seen Sofia poke her head under the comforter, while leaving her body out in plain view. Burying her head in a dark secure spot, gives her a sense of security. She doesn't always feel like hiding under something though -- sometimes she just wants to sleep in her favorite wide-open spot on the couch. The only thing she can do for security is cover her face. It may not look safe, but she feels fully protected. Your high-maintenance ball of fur spends roughly one-third of her waking hours grooming herself, PAWS Chicago explains. That's a lot of work to stay clean and pretty. So naturally, she gets warn out easily. During her grooming session, she could start to zone out from pure exhaustion while cleaning her face. So her paw just lands right there, over her eyes, because making the extra effort to move it back down towards her body takes too much effort.